A leading Latino journalist looks at the left-populist uprising that brought Bill de Blasio into the New York mayor’s office and sharpened the nation’s blue-red divide. As Democracy Now! co-host González (Fallout: The Environmental Consequences of the World Trade Center Collapse, 2002, etc.) notes, de Blasio’s electoral victory in 2013 was far from a certainty, but it expressed a frustration with the status quo—and especially a sense that the best things of the city had been handed over to the very wealthy. That win instituted “the most left-leaning government in the history of America’s greatest city.” But de Blasio’s victory was also not isolated. González suggests that from the outset, “de Blasio believed no single city, not even New York, could successfully reduce income inequality on its own,” seeing himself in the vanguard of a populist movement that would reshape America’s cities and recast federal policies relating to them. In this he has been only partly successful, even as many of his reforms—on immigration, fiscal policy, family leave, and higher taxes for the wealthy—have hit stumbling blocks and some once-progressive city governments have moved to the middle or even right. 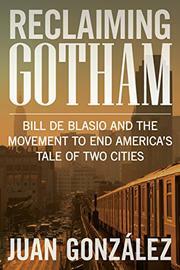 Still, as the author notes, de Blasio’s victory was not singular. With him came many other progressives in New York government, helping make the city more unlike so many other places outside of it—for one thing, it is both a center of undocumented immigrants and also “an engine of enormous prosperity.” (He also notes, significantly, that so-called sanctuary cities have lower overall crime rates than their anti-immigrant counterparts.) González is a touch worshipful, not toward the mayor as much as the cause, but also not uncritical of missteps and blunders. Urban activists in other cities have much to learn from New York’s experience, and González’s book makes a good place to start.